Is Heart of Darkness Racist? By Brian Hoey. Dec 3, 2015. 9:00 AM. 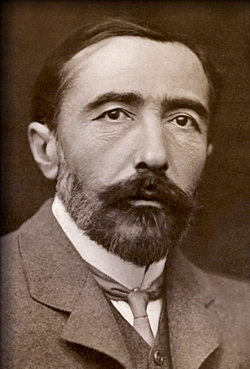 During Joseph Conrad’s lifetime, little fuss was made over his 1899 novella Heart of Darkness. Of the three pieces of writing all bound into the single volume in which Heart of Darkness was sold, what would come to be the author’s most famous work received the least critical attention. It was initially passed over in favor of works like Youth: A Narrative (1902) and The End of the Tether (1902) that history has largely left to fester. Over the course of the past century, however, Conrad’s once-obscure work about a young man, Marlow, taking a trip down the Congo River, has become one of the most-assigned and most-discussed pieces in the canon. It remains, today, one of the most ubiquitous items on college course syllabi around the United Sates. And with it comes a varying range of views, critiques, and feelings. The novella, which likely has Conrad’s many gifts as a prose stylist to thank for its (comparatively) recent longevity, has, in general, been read as a scathing critique of European colonialism in Africa. It makes a point, after all, of showing the destructive effects the colonial effort has on the psyche of both its narrator and its focal point, Kurtz, and goes to lengths to question the virtue of apparently-less-than-well-meaning Europeans. So powerfully embedded in the cultural consciousness is the book that it even formed the loose basis for Francis Ford Coppola’s classic 1979 film Apocalypse Now, which sets its action in Vietnam during the Vietnam War. All of which is to say that it’s not surprising that such a widely read work should be the subject of its share of controversy. In this case, the controversy starts with Nigerian author Chinua Achebe, a literary titan in his own right. In his essay “An Image of Africa: Racism in Conrad’s Heart of Darkness” (1977) Achebe argues that while Conrad’s work is often heralded as a triumph of anti-colonial sentiment, it is, in fact, every bit as racist as you would normally expect nineteenth century writing about Africa to be. Achebe’s contention is that, though Conrad thinks poorly of just about everyone he writes about, he miscasts European’s as the victims of colonization in addition to its perpetrators. To wit, the willfully vague and mysterious descriptions that Conrad’s narrator uses to describe the people and places he encounters on his trip serve to present, rather than a particularly positive or particularly negative portrait of Africa and its people, no portrait at all. By privileging the European perspective (to say nothing of making all African characters essentially mute, indistinct masses of eeriness), Conrad reaffirms the common narrative of Europe’s superiority over Africa, suggesting, by Achebe’s account, Africa should be avoided by Europeans because of its otherness, its mystery, and its (supposed) inferiority. Though compelling (and widely anthologized), Achebe’s argument is not fully accepted as gospel. Literary scholar Hugh Curtler, for instance, in his essay “Political Correctness and the Attack on Great Literature” (2009), accuses Achebe of being a sort of politically-correct crusader, bent on removing all material that might offend anyone from college courses (an accusation both deeply ironic and hard to bear out in Achebe’s text which nowhere calls for the removal of Conrad’s book from syllabi, contending only that it doesn’t qualify as a great novel). Further, Curtler questions the presence of racism in the novel, suggesting both that a racist author with a decent aesthetic sensibility may well produce a non-racist work and that a racist narrator doesn’t necessarily imply a racist piece of writing if the work presents its narrator ironically. While Achebe might reasonably accuse Curtler of addressing the question of personal racism and bigotry (which may be absent from the text) while ignoring fundamental assumptions of European superiority built into the structure of the book, their disagreement does raise important questions about how and why we read. Great writers like James Joyce and F. Scott Fitzgerald sometimes peppered racial slurs into their writings, and poor attitudes toward women abound throughout the history of literature, but we are, probably rightly, loathe to give up Ulysses (1922) and The Great Gatsby (1925). When does a particular depiction or representation go from temporarily distasteful to potentially destructive? How do we dissect the politics of a work of art in a way that’s fair to both author and reader? Do we read simply to be entertained, or do the books we read subtly sculpt our worldviews? Whether history ultimately decides that Heart of Darkness is too racist to be great literature or too great to be racist, we can at least thank it for forcing readers and scholars to confront their own assumptions about literature.